Bo knows churches. He’s been planting them since he was a US-2 summer missionary in Oklahoma in the 1970s. And, he even trained his predecessor at the Baptist General Convention of Oklahoma to plant churches. Bo Holland was named to succeed Ted Lam as church planting specialist earlier this year, after serving four years under Lam as a church planting strategist. It was while Holland was a jointly employed missionary with Tulsa Metro Association that he met Lam, who was attempting to start an international church in Tulsa. “I was a church planter in the area, and helped him plant his church,” said Holland. That’s what Holland has been doing for more than 30 years, and there are well over 100 new churches in the state because of his efforts. After serving with his wife, Patsy, for two years as a US-2 missionary, Holland went to New Orleans to complete seminary, then returned to Oklahoma, working in East Central Association planting churches. Before moving to Tulsa Association, he worked in 11 counties in Northeastern Oklahoma, planting churches and helping to facilitate new works. As the new church planting specialist, Holland said he wants to keep the momentum Lam set for planting churches. Holland noted mobilizing includes enlistment, recruiting and getting church planters on the field, while developing is training leadership. Holland emphasized that his team doesn’t plant churches, but helps facilitate those whom God is calling to plant churches. He said he is often asked why new churches are needed. 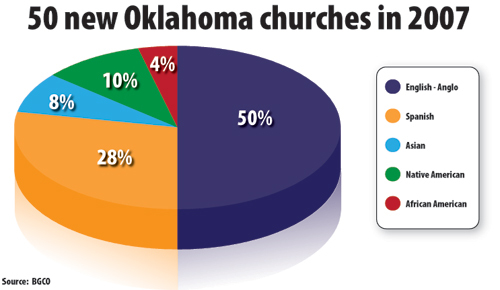 In Oklahoma, there seems to be a Baptist church on every corner, so why start new ones? Holland said there should be no worry about distance between churches, but about density of people in certain locations and different types of people moving into areas. Holland acknowledged that there needs to be different styles of churches. Lay people, Holland disclosed, need to be encouraged to help start churches. He said he believes there are lay people who want to get involved in starting churches, but they have to be encouraged. “In our churches, we hear a lot of invitations to ‘come,’ but seldom do we hear ‘go,'” he noted. Holland observed that the history of church planting throughout the nation has involved lay people. He said his office sponsors a seminar called “Discovering Church Planting in Oklahoma” which explains the need, who God calls, how to get involved and the places needing churches. Holland said more partnering churhces for new church plants are needed, whether it is one church helping another or a cluster of churches aiding a new start. Randy Adams, Church Outreach Team leader, said he is grateful Holland accepted this new responbility. 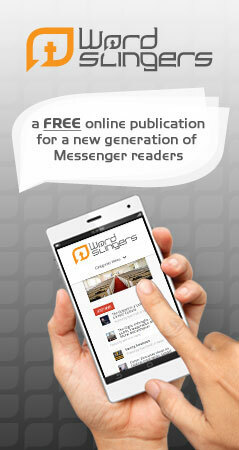 Adams emphasized that the most effective churches in reaching lost people are new churches.